…And dealing with difficult transitions. Hoping next week, to work less and find a new place of solitude. Then, more writing and sharing of things. I look forward, with much wanting to express. This includes more thoughts on short term travel, creativity, ideas, observations, experiments; all trapped inside my head waiting to escape through my typing fingers. I still need a good place and time to sit down, and then release! I hope those following my blog and matching Facebook page will stick around. Also, I will soon peek and see your latest sharings. Many “likes” and occasional comments will happen. Thanks again to all, for the patience in waiting. 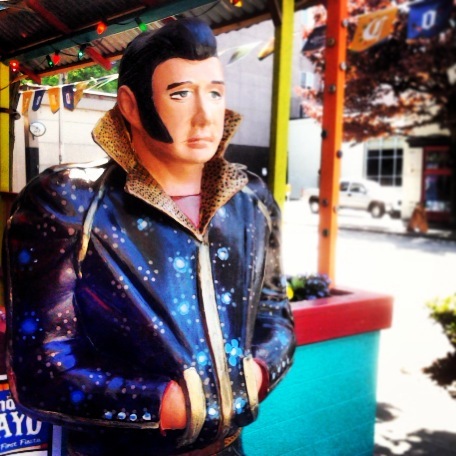 My instagramed picture below is taken from Mama’s Kitchen, Seattle’s oldest Mexican food restaurant (38 years). If nearby in the Belltown district, try one of their comically huge burritos soon! Posted on May 19, 2013 by Orion T.	This entry was posted in Uncategorized. Bookmark the permalink.